where do you look for sunshine? When rain in Seattle or Portland makes national news, you know things are about as bad as they get here. Standing water on freeways, drains unable to keep pace with the deluge, stretches of highway closed, even a few small towns along rivers evacuated. We get grey days, and mostly gentle (and occasionally incessant) rain here, but not monsoons that turn umbrellas inside out and flood boots with the rain that falls fast down our jackets. I was hydroplaning down the freeway about 10 miles an hour below speed limit, heading toward a long (and long-overdue) coffee date with a dear friend. Carolyn had been out of town for more than a month and I’d missed her. I was thinking of her sunny self as I tried to see through the waterfall that was my windshield. I was thinking too about where it is we go looking for sunshine when our eyes and skin are hungry for it. Carolyn and I sat drinking our large steamy cups of chai, catching up with the parts of each other’s lives we’d missed. And then, from beneath the table she brought out a canvas banana with a zipper along one side. “Bananagrams,” she said. “You’re going to love it!” She spilled the tiles onto the table, and we turned them over, letters face-down, as she explained how the game is played. Carolyn was right of course, my friend knows me. From here on out, along with my camera, Bananagrams go where I go. Not long ago I’d visited a fellow-blogger – Violets and Cardamom – and was struck by her pretty mango lassi. It was lovely. Today, I winged my own with several changes. 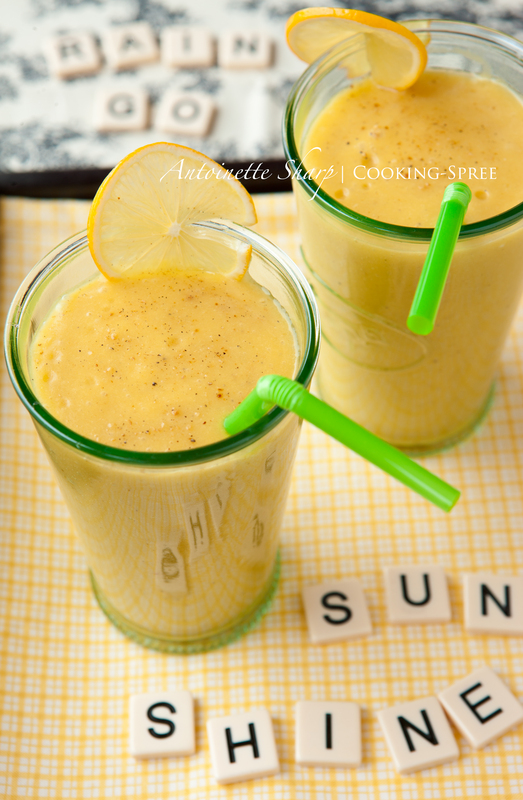 Knowing the deliciousness of the pairing of mango, coconut, ginger, lime, cardamom and banana, it was a simple matter to drop them into a blender, whir them up, pour them out, and stick a straw into a glass of gleaming sunshine. Drop ingredients into blender, whir, pour. Sprinkle if you like with a touch of cardamom. This smoothie called for a little muffin, filled with warming bits of candied ginger and apricots, and a smear of sweet butter, melting. 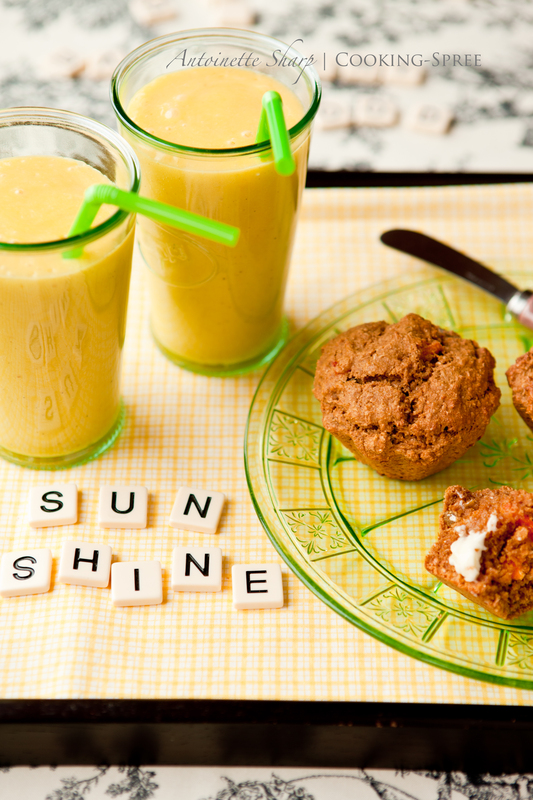 Today, in the very midst of a monsoon, I found sun shining in my friend’s face, in a steamy cup of chai, in a mango ginger coconut cardamom smoothie and in a warm and homey muffin. I found it too in a banana bag of tiles that spell out whatever I may ask them to. for a printer-friendly version of the recipe, click here. I apologize! Briefly the print link above wasn’t taking you to the right spot. It is now. Love the colour of that smoothie, just like the bananagrams’ bag! Great game! I know! In no time, hooked! Beautiful photos! And love the addition of the coconut milk and lime. Sounds amazing! Looking forward to trying your version! Very neat picture of sculpture – absolutely on the button. Lovely post. Oh, that’s lovely Chica! I picture it well! Bananagram – a bit like scrabble, but you each play your letters at the same time, on your own make-believe board. (In other words, on the open table in front of you.) You can, as many times as you like, change the configuration you’ve created, making new words from your old ones, as you try to place all the letters that come to you, one by one. As your friendly opponent uses up the tiles in front of them, they call “peel” and you each draw a new tile, and then another and another until the whole pool is used up. If you like words, and you like play (and I know you do!) this is FUN! And all in a little banana that fits in the palm of your hand. This sounds amazing – I´m going to track this down and get one each for me and my girlfriends and then we can play it “virtually”! This post made me so HAPPY! I love the saturated colors, the bananagrams, the recipe. And oh my, how I adore mangoes. This is certainly a must-have for me. Was just thinking this morning your exact question: where is the sunshine in the midst of the gray? I certainly found some here, and also in heart-to-heart conversations and laughter with family and friends. By the way, I loved how your dripping-faced beauty and the letters played the grounding foil for the bright. The dark made the sunny more sunny. Brilliant! Oh thank you, Ashley…you notice all the little things, don’t you?! Thanks for that! Sis, I felt the same way reading this! I’ll be making this sunny smoothie snack for my sweeties today after school and I’ve got to get this game – heard it’s fun for all ages. Lately, I’ve found a little sun each morning to wake me up, by way of my latte!! Love my Gaggia! !Thank you mama! We were hearing about flooding out your way this morning. Hope you’re safe. These look wonderful too. We’re on higher ground Greg, but really sweet of you! Others, sadly, are not. Our country is so vast. While you’re facing rain and floods, we’re facing a snowstorm. Either way, though, your smoothies are a welcome bit of sunshine. I am glad to read, by the way, that you’re not in harm’s way. I hope the rains stop before many more people are impacted. I’d heard of your snow too John, and oh man! is it cold there! You’re so right – the country’s vast enough to have virtually every sort of weather going on at once. Late spring might be nice for all of us. I think I can make it, and hope you can too! Thanks so much for kind thoughts. I’m wishing for what you’re wishing! I look for it regularly in your company and countenance, and always find it there, Spree! Your insides are exactly the colors of this lassi! No one who reads your post should doubt that…As the deluge keeps coming, I can breathe in some mango shine. Which I intend to create for myself this weekend. I love your attention to detail, including the blurry two words in the background. Amen! By the way, just where does that steely lady reside? Exquisite profile. Loved your answers to the question where do you go looking for your sunshine! And I’m thinking, just Maybe I should be adding a “Happy Lamp” to the mix! Now I’ve been making oodles of mango lassies and smoothies the last few weeks (being mango season here.) But do you think I would have ever thought to put lime, coconut and cardamom in it? Hell no. How brilliant is that! I liked them plain, but I have a sneaky suspicion I’m going to love them with the other goodies in it. You outdo your self with each new post. What a great visual treat in so many different ways. I am looking at the beautiful manhattan skyline (the empire state building lit in blue in celebration of the giants’ playoff game tomorrow) after a day of watching snow fall, reading your sunshine post. Oh how I would love to wake up to the smoothie, muffin, and latte. Beautiful photos that brought sunshine to me. I miss you! Deb, I’m missing you too! Hurry home! I am finding my sun shining in this post! Such delectable photos to go with a delectable recipe. And since I love mango so much, this is a recipe that will be used as soon as I find a nice mango – probably on my next trip to Meijer in one of our nearby towns. Spree, your smoothie is definitely a glass of sunshine. It will be a nice break for all of us that are dealing with weather problems. Hope the real sunshine is back in your part of the country soon. Until then take care. Karen, ahh such a sweet compliment! Thank you! I know you’ve been having your share of the nasties too, so I hope the sun shines bright and soon on you too! We have not seen the sun in a week and I know what you mean about looking for your sunshine.. Thanks for the great shots of sunshine – we need it here in Vancouver too – endless grey and rain make it so hard to find cheer! I’ve been growing sprouts at home to see cheerful life – those little tails make me smile!